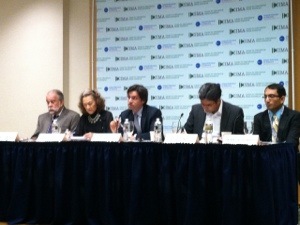 The Center for International Media Assistance (CIMA) brought experts, focused on Pakistan, to share their. experiences in a world where journalists are at risk. Big risk. Malik Siraj Akbar has risked his life trying to bring balanced reportage to Pakistan’s media. He cites the limitations on journalists. They have to survive economically by aligning themselves with a paper (and onerously with the publisher’s agenda), an advertiser (and their agenda) , or an NGO. This environment is guaranteed to stifle independent and free reporting. According to Robert Deitz, 22 journalists have been killed since 2004 and many of these murders were triggered by a report on a crime or corruption and when the insulted party exacted lethal revenge. 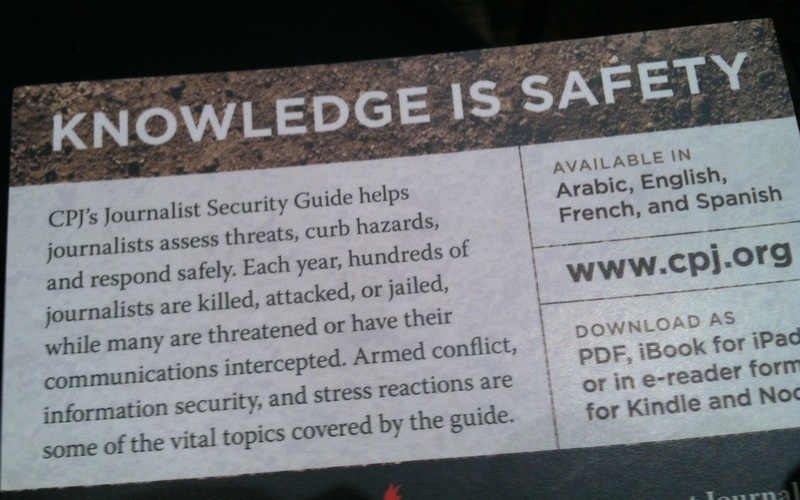 The Committee to Protect Journalists (CPJ) rolls out a card…crucial in Pakistan, Russia, Somalia, Ecuador, et al. Interestingly, the (available PDF) report quotes Pamela Constable’s work, Pakistan at War With Itself (our review here) and the poisonous environment of Pakistan’s society. In the citation, Ricchiardi goes another lap with a time-worn tidbit that launched a thousand Indy’s (Indiana Jones, Spielberg’s character in the 1981 film “Raiders of the Lost Ark“). Indy, our hero looks down into an uncovered tomb and sees the floor below covered with squirming snakes. Stay with me here. During the 19th Century’s “Great Game” between colonial powers Tsarist Russia and Great Britain, wrestling over India and South Asia, the legendary and much recounted torture of British adventurers in the “Black Pit” of Bukhara was born and continues to justify the stereotype of the unspeakable and wanton savagery of Islam believers. I explore this on another post on stereotypes “hardwired” and “grandfathered” into Western culture that just won’t go away. Please read our review of Constable’s book and link to our stereotypes post here. This entry was posted in Breaking Forums, and Reports, Mideast, S Asia and Arab Spring, Symptoms in the Americas, [Im]pure Wired Politics and tagged afghanistan, bukhara, Center for International Media Assistance, Committee to Protect Journalists, connolly, corruption, Daniel Pearl, Dunya News, great game, Harrison Ford, independent media, independent press, Indian Jones, iPhone, iraq, islam, Islamabad, Karachi, kashmir, National Endowment for Democracy, pakistan, pashawar, south asia, stoddart, Washington DC, waziristan. Bookmark the permalink.